The third season of TNT’s hit drama Murder in the First continues the series trademark storytelling and their willingness not to back down from important social issues that can affect us all. One of the characters who is stepping out into the spotlight this season is District Attorney Mario Siletti, who is played by veteran actor Currie Graham. Graham is certainly no stranger to television fans as he has built an impressive resume. He's appeared on series such as 24, Boston Legal, Desperate Housewives, NYPD Blue, Judging Amy and most recently Marvel's Agent Carter. This season we are seeing an entirely different side to this character and as the season continues, it remains to be seen what more we will learn. We sit down with Currie to talk about the new direction of his character, the importance of tackling current issues and how he is enjoying playing Mario Siletti this season. Pop Culture Principle – In the first two seasons of Murder in the First, we really didn’t get to know much about your character. Did you feel your character was somewhat boxed in a corner on the series? 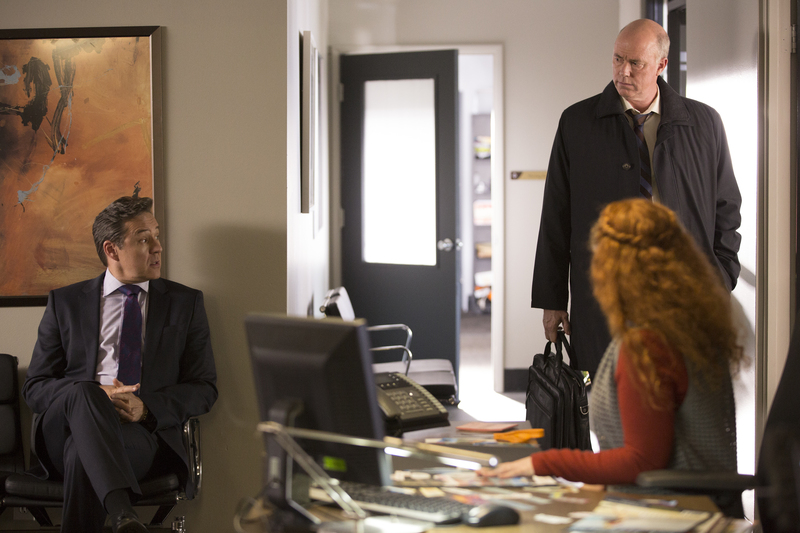 Currie Graham – Yea, I kind of felt like it was sort of a utilitarian role and that they knew what they needed from me. I’ve worked for Steven Bochco a lot in the past, so I knew that if we got to keep moving forward that he would eventually find a way to “unpaint” the box that I was in. I certainly enjoyed the material from the first two seasons and I really enjoy doing courtroom stuff, but getting the chance to get out and get dirty this season has been fun. 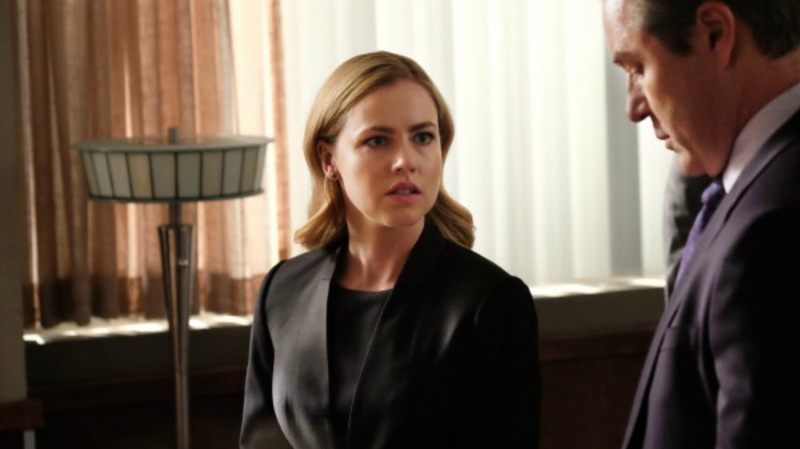 Pop Culture Principle – Did those first two seasons give you time to really get to know D.A. Mario Siletti and flesh him out? Currie Graham – Yes, I think it did and it was good to show the writers who this guy was going to be. I’m not sure that everybody knew exactly what he was going to turn in to. It’s fun to go on a show and not mind that people don’t like me, I am ok with that. I don’t need to be Mr. Cuddled. If I’m morally ambiguous, that’s fantastic. Let’s go with moral ambiguity. I get a lot of mail and people tell me that my character is a jerk and to me, that’s great. It lets me know that you are feeling something. If you love to hate me, that’s fantastic. Pop Culture Principle – When did you find out that your character District Attorney Mario Siletti would have a major storyline in the third season of Murder in the First and what were your initial thoughts? Currie Graham - I was very excited about it. Steven had sort of talked to me about it and told me the direction they were thinking about going and I told him I was all in for that. He knows I am not afraid to be disliked or be the bad guy. He knows I’m not afraid to jump in and if I’m going to wear that color, I am going to wear it all the way. He took some chances with the writing of this guy and he sort of comes off a bit sociopathic. In the first episode he kills someone and then they find him sleeping in the interrogation room. The way he uses his words and everything for him is about semantics. He really thinks he’s the smartest guy in every room. His hubris is what gets in the way of him being just a great guy. I think the fact that he knows he’s the smartest guy is what makes him just a little unlikable. Pop Culture Principle – You’ve played a cop, a judge and a DA before in your career. Was it easy for you to slip back into the legal system mindset for Murder in the First? Currie Graham – Yes, it is. I enjoy that theater and the whole theatrics of a courtroom. I enjoy the wordplay in a courtroom. Obviously, dialogue is very important when you are playing a lawyer and you have to have good words and I love to play around with good words. To be able to tell a story with some very dry dialogue, it’s always a challenge. A lot of people will see it as legal mumbo jumbo, but if you really understand it and really get behind it, then it becomes exciting to people. If you look at what James Spader did with Boston Legal, it was amazing. Pop Culture Principle – You have some very powerful scenes with your wife on the series played by Jamie Luner. What has your experience been like working with her and with such emotional scenes, do you guys discuss those scenes before you shoot? Currie Graham – It’s funny, when we first started working together, our relationship on screen was very contentious and for whatever reason I kept her at arms length. I’m not sure if it was me being method or me being a jerk. We never really got close and we never really talked much. We would come in, do the scenes, say good job and then go home. When I saw the season starting to unravel and there was going to be some kind of intimacy between us and we were going to start to bare our souls and reveal ourselves to each other, I reached out to her and started to get closer to her. In terms of actually talking about the scenes, we really don’t talk that much about them. We sort of have a nice shorthand and we’ll rehearse the scene once or twice and if there is anything to say, we’ll talk about it without the director there or with the director there and we just feel our way through it. She’s very open to letting it all happen and she’s very available as an actress which is great. She’s not afraid and not shy and she lets it all out. It’s fun to play ball with somebody like that. Pop Culture Principle – Can you tell us about the main storyline this season and the storyline for your character? Currie Graham – In the main case, we have a popstar dating a star quarterback and she’s throwing a 30th birthday party for him at a club with around one hundred people. Somebody comes into the club and shots him in the head and kills him. It was a brutal seen and we were delayed a week because of the tragedy in Orlando. Both our show and The Last Ship had scenes with a shooting in a club. I felt it was good that the network left a little space to give people time to mourn. The second episode there is a Black Lives Matter moment were Taye Diggs’ character shoots a guy who he thinks is armed and then they don’t find a gun. I think it’s a very poignant moment because everybody today is talking about police brutality and it’s interesting to look at that from an African-American point of view. It’s about a black police officer who shoots a black guy and how he feels about it. It’s a pretty interesting storyline. On my side, I have a birthday party where my wife and my girlfriend are there. My girlfriend texts me to come to the lobby and we end up in the ladies room having an extramarital affair. It’s the perfect example of how one little mistake in life can lead to a tsunami of crap. I then end up driving drunk and I run over and kill this poor woman. I’m now fighting for my life, fighting for my livelihood and fighting for my family. My character is alone in this now and pretty much on his own. Pop Culture Principle – As an actor, do you feel it’s important that television series not be afraid to tackle difficult and current issues in society? Currie Graham – I do feel it’s important. I feel you need to be socially conscious and to know what people are talking about today. You should tell the story as truthfully as you can on a cable show. I thought it was an interesting storyline for Taye and I haven’t had the chance to talk with him in depth about it, but it’s a pretty big deal. I think that anything that will allow the conversation to continue or anything that opens society or opens people up who may not necessarily be forced into that conversation, but they tune into our show and they get the opportunity to see what is going on portrayed in a real way, I think it’s important. Anything that spurs a positive dialogue with people is important. I think this sort of shows both sides of it, actually more that both sides because it’s a black police officer shooting a black guy. Is he innocent? Is he guilty? Is it Taye’s character’s problem? Why did the guy run? Should he have been shot? It’s a very tricky situation for this particular case. Obviously, I read the news and see the trigger happy police officers that are out there and I think that we have to start to have a conversation about that. Pop Culture Principle – Besides Jamie Luner, the stellar cast also includes Taye Diggs, Kathleen Robertson and Raphael Sbarge to name a few. How you have you enjoyed working with the rest of the cast? Currie Graham – We are like a big family. We enjoy each other’s company, we hang out and have a lot of laughs, but when it’s time to work, we get after it. These three years have really been great with these people. We each have our own drumbeat, we all have our own music playing and everybody is cool with it. There are no divas and no on set theatrics and it’s just a team of really good people who love to go to work and do some really good stuff. Pop Culture Principle – Do you see Mario Siletti as a flawed human being and his own worst enemy? 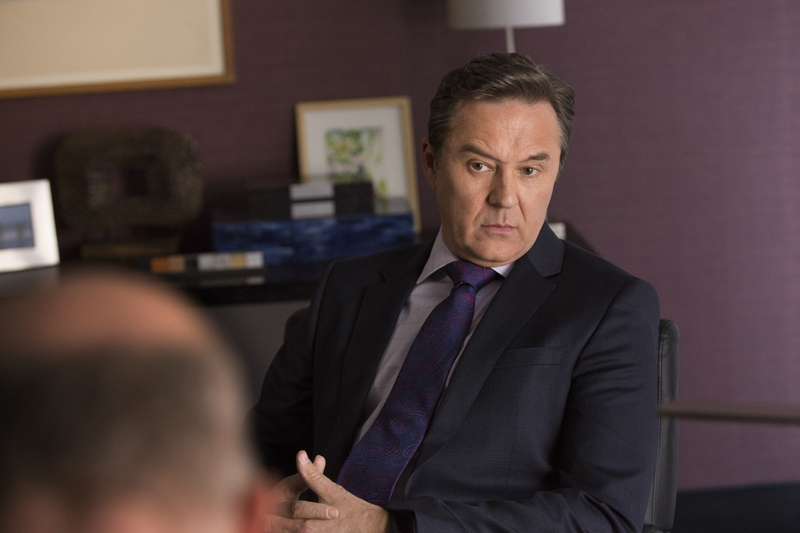 Currie Graham – Yes, I think he’s a very flawed human being and I do feel he is his own worst enemy. It’s funny how, sometimes I feel like the smarter a person is, the more obvious their flaws are. Mario is morally ambiguous and for him there is no black or white, everything is a little bit grey. I think people in our society sort of gravitate towards black or white, Republican or Democrat. We like to sort of compartmentalize things and Mario is not that guy. He’ll do something and you can’t believe that he’s such a jerk, but then turn around and do something else and you feel sorry for the guy. You wonder how you can feel sorry for the guy because you know he’s a jerk, but you still like him and I think that’s what makes us all human. I know I personally mess up and do stupid things, but at the same time I’m a really nice guy and try to be a good human being. I think we are all like that and I think if people can stick with him, they will see him pull the curtain back for a short amount of time and see what’s really inside. Pop Culture Principle – The final scene at the end of the first episode when your character finds out that his lover will be prosecuting his case, the camera closes in on him and he has this very subtle smirk. Was that scripted or instinct? Currie Graham – That was instinct. I wanted to reveal something, but I didn’t want to tell a story. I wanted to give the audience a bit of an idea of how he thinks the case is going to flow. In his mind he kills this woman and he cries on top of her body when she dies. He gets in the police cruiser and the next time we see him, he’s completely compartmentalized everything and he’s back on his game. It’s like it never happened and I think that’s kind of the way he is. I think he’s able to compartmentalize, justify and rationalize his way through life. In that moment that you saw that smirk, he thought the case was over and it was in the bag. Again, that goes back to his hubris getting in the way of him actually being victorious because if he hadn’t made assumptions on what this woman was going to do, he wouldn’t have had such a hard time. Pop Culture Principle – As an actor, do you prefer having a case wrap up after each episodes or do you enjoy spreading a case out over the entire season format? Currie Graham – I love this format. I think it’s good for the audience, good for the actors and good for the writers. It’s like getting a ten-hour movie. You can sit down and watch ten episodes and you get a chance to get involved with these people and get to know them better. I love this format and I’m a huge fan of the serialized drama as opposed to the procedural thing. I’s cool the way Bochco does it because we don’t know what is going on. He doesn’t tell us anything, so we are just playing week to week. He said he would lay it out to us if we really need it, but I just decided to play it like life because I don’t know what’s going to happen tomorrow, so that’s the way I play the show. When I was on NYPD Blue, I was playing a character who was a really tough guy. I get a call from Steven asking me to stop by the office. I walk in and he tells me that in the next episode you are going to be dead. I asked him did he want me to do anything different and he said no. I love that because there is no shading. I didn’t shade that tell at all and when the audience finds out, they had no clue it was coming. I feel like if he had told me that, would I have subconsciously or consciously shaded it in that direction? I don’t know, but I didn’t want to take that chance. For this season, he asked did I want to know the storyline and I said no, not really. He just gave me a few notes on the first episode, but that was about it. I just let it happen and if I am surprised, the audience will be surprised. 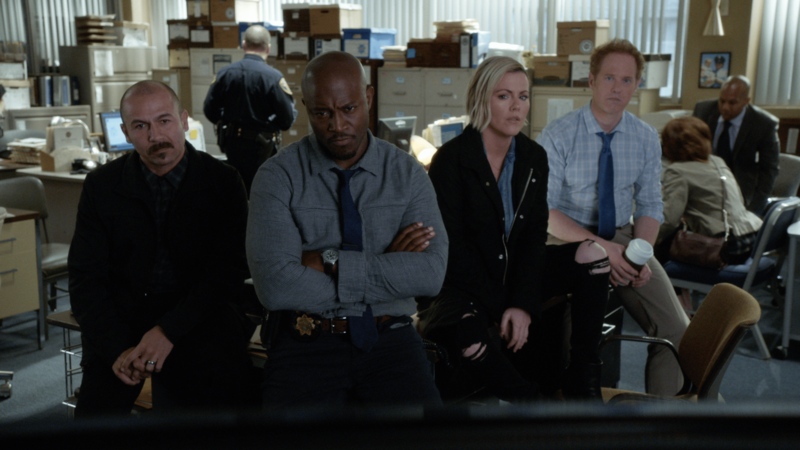 Pop Culture Principle – For a large ensemble cast, it can be difficult to get each actor to have their moments, but it seems Murder in the First has been able to do that so far with its cast. Would you agree? Currie Graham – Yes, I would. I feel like the writers have been sensitive towards giving people time to explore their characters. As the season has gone on, everybody has sort of gotten a taste and everybody has had a moment to step into the light and I respect that. It’s difficult to do, but it’s a sign of writers not being lazy. I’ve always said that when are doing a series, it’s much easier to write a guest star than a series regular. When you write a series regular, whatever you write for them, you live with. For a guest star, you can write the craziest stuff and then you can throw them in a dumpster and not worry about it anymore. When you are writing for a series regular, if the show is going to go for a while, you have to live with that. So, it takes some courage and some time to do that. I feel like Steven and the writing staff have done a great job in doing that and exploring the regulars that we have and giving them all a chance to shine. Pop Culture Principle – The cast and crew usually tweet live with the fans during each episode. How have you enjoyed interacting with the fans on Twitter? Currie Graham – You know what, I love reaching out to the fans. The way we use to market products was billboards, signs on buses and in magazines. Now we market individually from cellphone to cellphone. As an actor, to reach out to your fanbase and let them know that you hear them and appreciate them, I think it means something. Someone tweeted to me and said that the car accident was partially my wife’s fault and that had never dawned on me and just things like that is very cool. That kind of interaction is fun and its great when fans reach out and have thoughts and feelings and it becomes its own Murder in the First community. People look forward to it and I look forward to seeing familiar names during the live tweets, it’s great. We appreciate the love! We would like to thank Currie Graham for taking time out of his busy schedule to talk with us. You can catch all new episodes of Murder in the First, every Sunday night at 10/9c only on TNT. 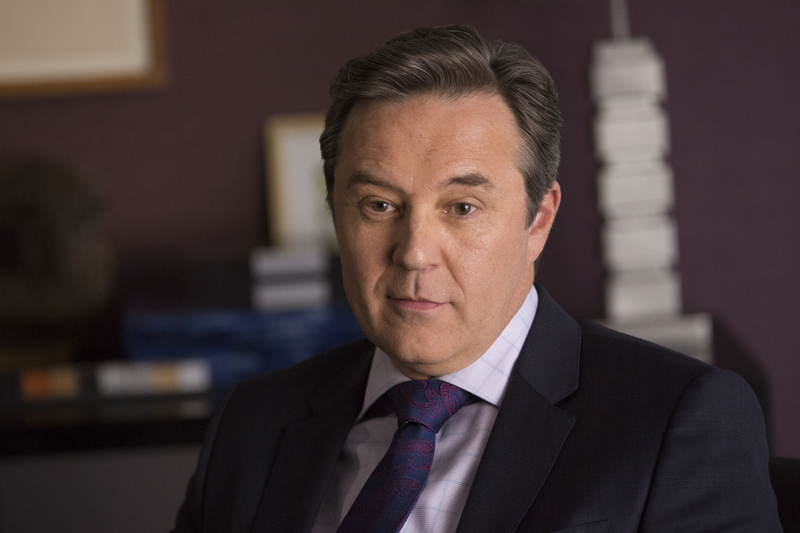 You can keep up with all of Currie's latest news and projects by following him on his official Twitter account @curriegraham.